Those were the headlines the day after Orville Wright flew a heavier-than-air flying machine a distance of 112 feet over the sands of Kill Devil Hills on the Outer Banks of North Carolina. 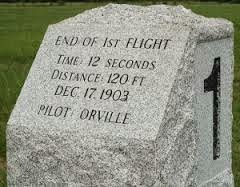 On December 14, 1903, after winning a coin toss, Wilbur made a three second flight attempt, stalling after takeoff and causing minor damage to the flyer. Three days later, having repaired damages, they made history with four successful flights. 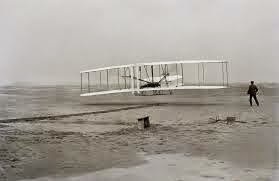 The first was a twelve second flight by Orville; the last flight by Wilbur covered 852 feet and lasted 59 seconds. 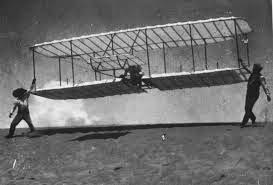 Wilbur and Orville Wright had been scientifically experimenting with the concepts of flight since 1899. 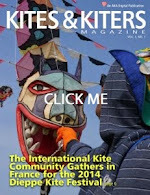 They based the design of their kites and full-size gliders on work done in the 1890's by other aviation pioneers. In 1900, the brothers traveled to Kitty Hawk, North Carolina to begin their manned gliding experiments. They made over a thousand flights from Kill Devil Hills in their gliders. The fundamental breakthrough was their invention of three-axis control, which enabled the pilot to steer the aircraft effectively and to maintain it's equilibrium. Besides 3-axis control, another key development for a heavier-than-air flying machine was a lightweight engine. Their shop mechanic, Charlie Taylor, built them an engine in just six weeks. 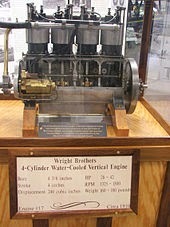 To keep the weight low enough, the engine block was cast from aluminum, a rare practice for the time. 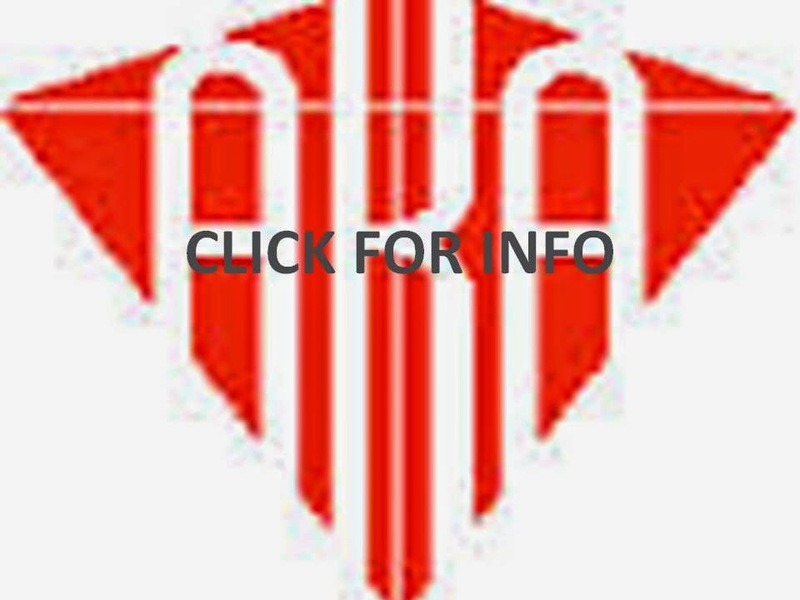 Their library research on propellers disclosed no established formulae for either marine or air propellers, and they found themselves with no sure starting point. After much debate they concluded that an aeronautical propeller is essentially a wing rotating in the vertical plane. On that basis, they used data from miniature wind tunnel tests to design their propellers; two contra-rotating blades (no torque) to push the plane, rather than pull it through turbulent prop-wash. Wilbur made a March 1903 entry in his notebook indicating the prototype propeller was 66% efficient. Modern wind tunnel tests on reproduction 1903 propellers show they were more than 75% efficient under the conditions of the first flights, "a remarkable feat", and actually had a peak efficiency of 82%. 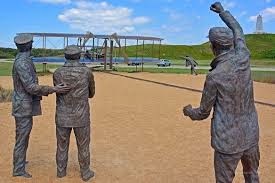 Were the Wright Brothers First? 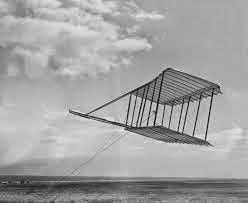 There are many who say the Wright Brothers weren't the first to fly a heavier-than-air machine successfully. Supporters of the post-Wright pioneers argue that techniques used by the Wright brothers disqualify them as first to make successful airplane flights. Those techniques were: a launch rail; skids instead of wheels; a headwind at takeoff; and a catapult after 1903. 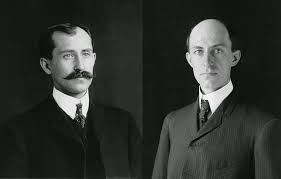 Supporters of the Wright brothers argue that proven, repeated, controlled, and sustained flights by the brothers entitle them to credit as inventors of the airplane, regardless of those techniques. Me? I'm pro Wright Brothers... but regardless, it was a magnificent feat by... well, you finish it. 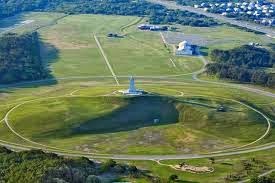 If your journeys take you to the east coast, why not plan to visit the Wright Brothers National Memorial, run by the National Park Service. 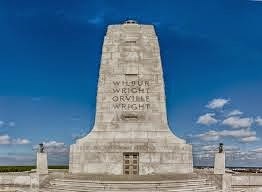 What the Wright Brothers achieved changed the world forever... and being a pilot, I am forever grateful, for up there in the air... well, it's just a magical place to be.